Chase Reinford cliff diving with his dog, Paco. They say your dog's personality is a reflection of you. I have the sort of fear of heights that produces anxiety just watching a video of someone jumping off a cliff, even from the comfort of my desk. My family's rescue dog, Bert, has the sort of general fear that causes him to visibly shake when he's in a an unfamiliar room. I'm not certain Bert takes after me on that, but I'm a little more convinced of the theory that pets mimic owners after watching a video of Chase Reinford and his dog Paco. Reinford and Paco are, to put it lightly, polar opposites of Bert and I. 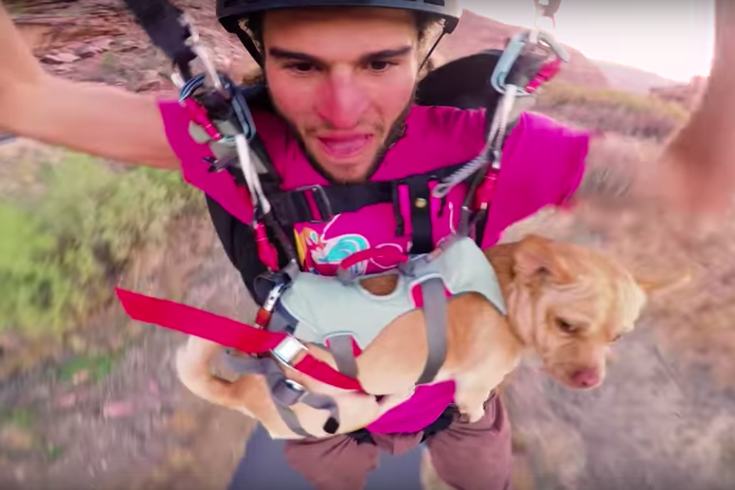 In a video on his popular YouTube page published in December, the 24-year-old explained how he found Paco on the side of the road while on the way to Lake Powell, which sits on the border of Arizona and Utah. Paco, according to Reinford, loves to go on boat rides and chase him around on his dirt bike. In a recent profile in the Daily Mail, the Philadelphia native called Paco, believed to be a Chihuahua mix, a "thrill seeker" who felt left out when Reinford would go cliff diving with his friends. So, Reinford went ahead and strapped Paco to his chest and jumped right off some dang cliffs. You can watch their daredevil stunts below. Paco, like Reinford, seems pretty unfazed about barreling through the air to potential death. Bert and I will be here on the couch.